Beans are a popular garden vegetable in Maine. They are prized for their mild flavor, making them an ideal snack straight from the garden. Most children like beans both raw and cooked making them the perfect addition to nearly any meal. Like many vegetables, bean come in several varieties. Although they all have similar flavor, they do differ in both taste and texture. Green beans are the most common garden beans and may be referred to as string beans. The name string beans comes from the fact that older varieties of bean had a tough 'string' down the seam of the pod. Modern beans are stringless. Green beans are cooked and served with meat or poultry. Purple beans are typically grown as a novelty as the pods are purple, but turn bright green when cooked. 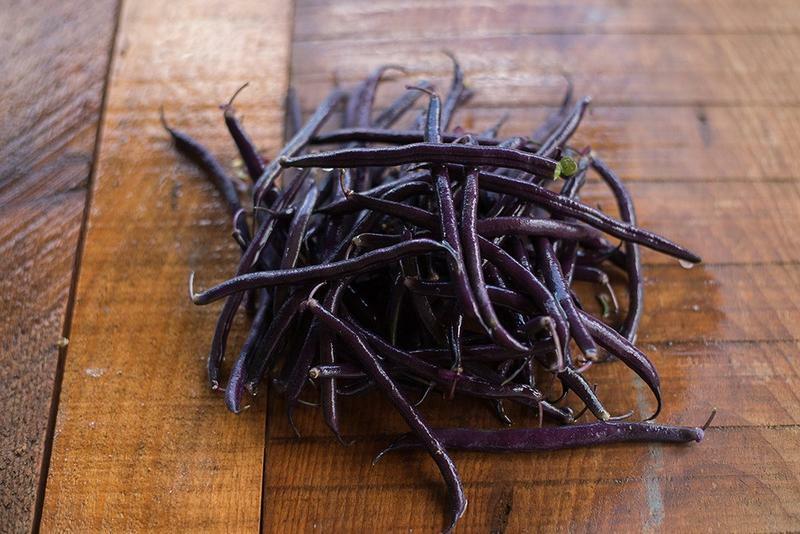 These beans make a colorful addition to salads, but don't count on the beautiful purple in cooked dishes. Some claim purple beans have a more intense flavor than green beans. Yellow wax beans may also be referred to as yellow string beans, especially by older gardeners. These beans are similar to green beans, but have a mild, sweet flavor. Yellow wax beans are typically cooked and served with cream and butter during the summer and canned for winter use. "Snap bean" has replaced the term string bean. It refers to any variety of garden beans that are snapped into sections to prepare them for cooking. Likewise, "shell (or shelled) beans" are not a variety of bean. The term refers to mature beans that are shelled and cooked similar to garden peas. Bush beans grow to a height of 12 to 24 inches, depending on the variety. They do not require staking or trellising. These include green, yellow and purple varieties. Bush beans are typically planted in rows in the garden, but can be planted in containers. These beans are a cross between bush and pole beans. They typically grow to heights of 36 inches. Half runner beans require a low fence or trellis, but are not as demanding as pole beans. These too come in a variety of colors. Pole beans grow to heights of 10 feet or more and require a pole, fence or trellis. They are prolific producers with large pods. Many claim the flavor of pole beans is superior to the flavor of bush beans. Pole beans may be yellow, green or purple, with green being the most popular. Keep in mind the overall height when choosing beans for your garden. Look for a variety that matches your space. Try growing yellow, green and purple beans together to add pizzazz to your vegetable garden.